"The first time you hear the word 'Daddy', I don't care who you are, your heart just melts." I blame Three Men and a Baby. Tim, brand-new. Nice specs, Dad. Good idea with the sticker, too. There we were, four twenty-something couples out together for a night at the movies in 1987, no distractions, no worries, just one of so many frequent nights out with friends. We could do that, then; we were only responsible for our own happiness and comfort. But near the end of the movie, Mario Joyner as "the cab driver" delivered that fateful line to the three hapless bachelors in his taxi heading to the airport to bring back the little girl they had been raising since her mom dropped her on their doorstep many months earlier. And in that instant, I knew life had changed forever for each and every man in our little group. I stole a glance down our row and saw three other Adam's apples bobbing up and down as quickly as my own as we each pretended that the scene had had no effect on us whatsoever. But the jig was up. "When that kid looks into your eyes and you know it's yours, you know what it means to be alive." Less than a year after that fateful night, the first of us fell as my friend Mathew's son was born. All of us visited him and his wife in the hospital and then again at home the day after they were released. We each took our turn holding this tiny bundle, sort of trying him on for size, and we each discovered that the "size" was a perfect fit: we wanted one of these for our own. 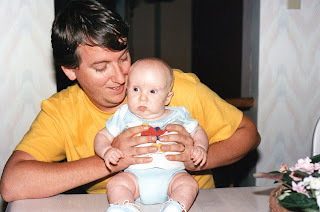 I was the next to join the League of Dads when my son, Timothy, was born in 1989. Bill followed with a daughter and then Tony added another boy to the mix. All four first babies were born within about 18 months of each other and all within a little over two years of seeing that movie. Its destruction of our four carefree, spontaneous, hedonistic lives was complete and irreversible. Wherever Ted Danson, Tom Selleck and Steve Guttenberg are today, I hope they're proud of themselves. I'll bet they have no idea what kind of power they wielded that night in a cinema in Toronto, thousands of miles from Hollywood. It would be easy to say "Chapter Two" of my life began the day my son was born, but it would be akin to saying that Titanic was just a boat with some cold water issues. No, there was no "Chapter Two": that first book was completed, published and stored away in a library somewhere. This was a whole new book, a book written in a language I had never read before, with pictures that were hazy and out-of-focus and yet of the brightest colours I had ever seen. It was also, however, a book that I had no idea I would even be interested in reading before then. I did not grow up thinking I wanted to be a Dad. It's not that I did not want to have kids; rather, I gave it no thought whatsoever. That is likely why I found it particularly startling when that light went on in my soul that night in the darkened movie house. 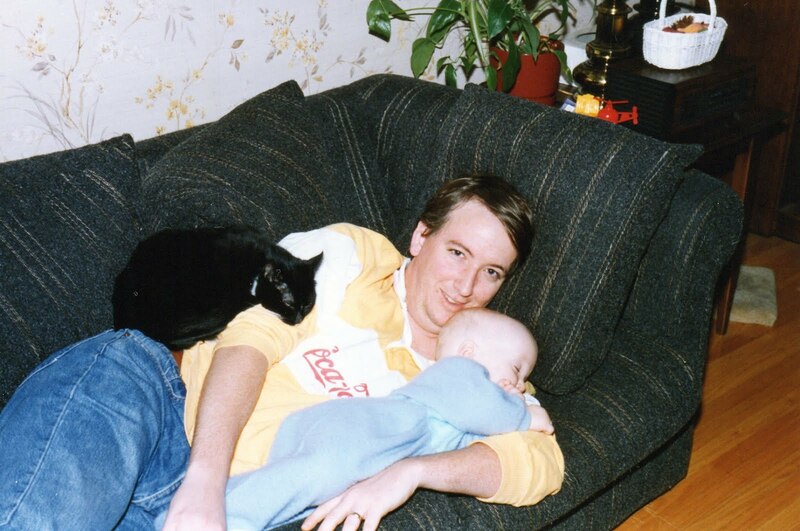 I was lucky enough to be home with Tim and his Mom for the first three months of his life. Because neither of us had to rush off to work during those weeks, we were able to share the work fairly evenly through the toughest period of any new parents' lives. I was able to spend many hours with my new son in the middle of the night, just sitting and watching him sleep or fidget or drink, singing to him and not caring if the hours ever passed. But eventually I went back to work, a new job as an Assistant Manager for McDonald's. 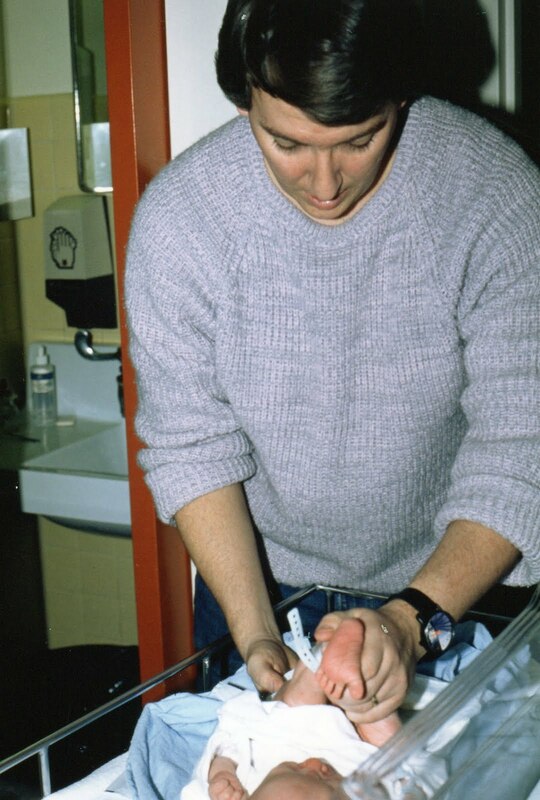 That was a very demanding job and a rewarding one, and it would have been enough for me scant months earlier, but it was very hard for me to be away from my child for long hours at a time. This situation was only exacerbated when my daughter, Gillian, was born 2 1/2 years later. I barely had a week at home with her and Tim when I had to go back to work and I started to realize I was going about it all wrong. It took a while to act on these feelings, but eventually (when Jill was a little over a year old) I left McDonald's and my children's mother went back to work for roughly the same pay for under half of the hours committed each week. And, in that way, I slid into the most comfortable, most rewarding and most fulfilling job I have ever had in my life: I became a Stay-At-Home Dad. It felt incredibly natural, this new job, and it never occurred to me that I might be any kind of trailblazer in those days of new enlightenment. I was seeing more and more Dads with their kids (no Moms in sight) everywhere I looked; apparently, though, I was misled into thinking it was the "new normal". This point was driven home to me when Tim started Junior Kindergarten and I signed up Jill for a twice-weekly, half-day activity session at the local library. 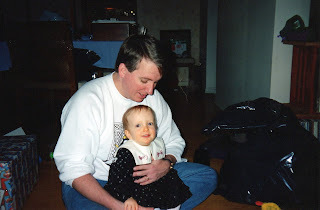 The first day we showed up, father and daughter, I suddenly realized how different my decision really was from the rest of the world around me. That first session there were 16 or 17 children signed up to participate and I was the only Dad there. In my "past life" (that is to say, the original story book before I had kids) this would have embarrassed me to the point of seriously considering never showing up again, but one of the many miracles of Fatherhood was how it instilled a bravado in me that I never knew I was capable of. I reveled in sticking out at that library, proud that I was raising the bar for the other Dads in the area. But the other Dads in the area rose to the challenge. That first year of Tim's school there were three separate sessions at the library. In session two, fathers made up about 33% of the parents who were there; by session three we outnumbered the Moms by quite a bit. I can only imagine the conversations that must have taken place in those homes after I blazed that trail and I was thrilled to have been the cause of such a meaningful "revolution". In recent years, because our building overlooks an elementary school, I have been able to observe the ratio of Dads to Moms undertaking the responsibility of Principal Caregiver; it is nowhere near 50/50 but "Stay-At-Home Dad" is most certainly not the jarring image it was when my children were tiny. 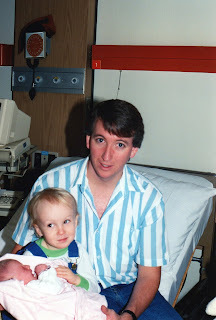 So what would have happened if I hadn't been a Dad? I might be high up the ladder at McDonald's pulling in money like it was going out of style, or at least well along a career path in some endeavour or another. I might have traveled the world, or at least visited more countries than four in total, including my own. I might have been to many more movies, many more sporting events, many more clubs. I might have spent my thirties being my own boss with my own rules that applied only to me, sleeping in on days off and hitting the road on any weekend just because I felt like it. I know I would have had more "toys". If I hadn't been a Dad I wouldn't have had to conquer my aversion to runny noses, learn how to braid hair, or clean up vomit from a throw rug at an hour of the morning that shouldn't even have a number associated with it (only to repeat the procedure ten minutes later). I would never have realized that it only takes a nanosecond for your non-swimmer child to fall silently into a pool while backing up to look at the full moon, needing to be rescued by a family friend, the only person who saw it happen even though I was sitting right there. I would never have needed to develop the innate sense of when there is traffic approaching so I can grab the arm of a child flying past me before he darts out in front of a car neither one of us saw coming. I would never have had to learn that croup can be fatal (it wasn't in Jill's case, luckily), having heard the word tossed about carelessly in my earlier years (eg, "sounds like she has a touch of the croup" when really it's just a bad cough). If I hadn't been a Dad I wouldn't have cared whose parents were home if they were throwing a party; I wouldn't have had to try to see the logic in a decision to proceed towards a BSc, one year each at the top two universities in Canada, only to conclude that future joy and satisfaction really lies in Theatre Production; I would never have had to "dress appropriately for the weather" simply to set an example for anyone else in my company that day. 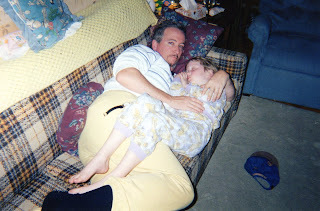 But if I hadn't been a Dad I would not be the man I am now - nor, really, a man at all for it brought me maturity that I would never have found from any other source. No, it's not for everyone and I had no idea how much I needed to be a Dad when I was younger, but being a Dad is the single most awe-inspiring, life-affirming, soul-enriching, heartwarming and spiritually uplifting thing I have ever done or will ever do with my life. I would do it all over again right now, if I could; with even the slightest bit of luck I will get my wish and Sarah and I will have a child together. Yes, even at my age. 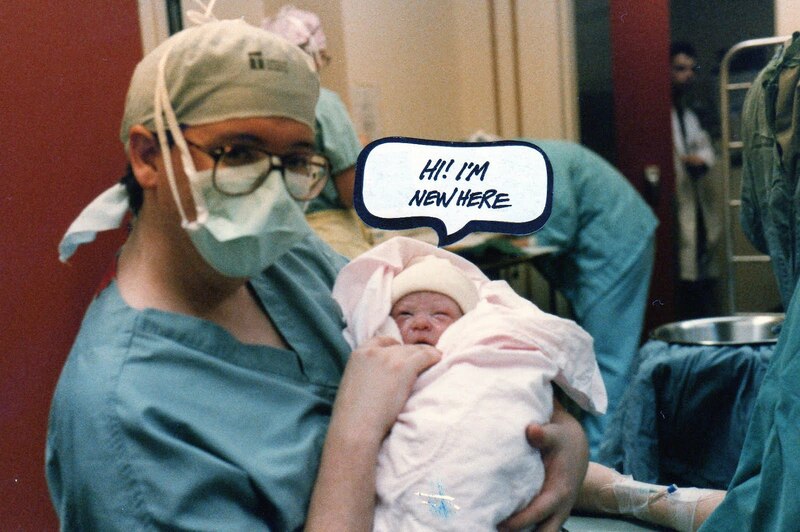 If I hadn't been a Dad? Unimaginable, now, and quite possibly the saddest thought I have ever had to contemplate. Because I am a Dad and it's the best thing ever. There's an article about stay-at-home dads in today's Metro that you may enjoy, page 18. Clearly, the rise of dads raising kids is part of the "Men's Revolution", something that is benefiting men and society at large. Thanks, Sar. There was also a piece in The Grid last week by Edward Keenan on being a Dad in Toronto that I quite enjoyed. I think I agreed with 36 or 37 of his "39 Things". I'll check out that Metro piece today! If anyone is trying to find that article through Sarah's link, you need to go to Page 18 in that digital version of the Metro Newspaper, once it loads. And a belated happy Father's day to you!! I tried very hard not to cry, and my determination was rewarded until "I wouldn't have had to try to see the logic in a decision to proceed towards a BSc, one year each at the top two universities in Canada, and then decide that future joy and satisfaction really lies in Theatre Production". :) Easily one of the best ways yet of how to describe why I made that decision. Happy Father's Day again, Dad. I love you. Thanks, sweetie. Love you too.